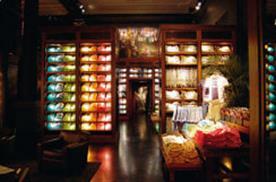 LONDON - The retailer built its global growth on basics, but has struggled to rival fast fashion. Nearly 40 years ago, Doris and Don Fisher opened the world's first Gap store in San Francisco with the idea that they wanted to 'make it easier to find a pair of jeans'. It is a principle Mr Fisher, now Gap's chairman emeritus, says the firm is still committed to. Given Gap's recent disappointing sales and decision to scale down its marketing and cut its design teams in Europe, it is reasonable to wonder whether its founders' views are holding the brand back. Certainly, Gap's salad days of the late-80s and early-90s seem a lifetime away, when the preppy look was a fashion staple. As its core customer base has aged and looked elsewhere, the brand has failed to attract younger shoppers. While cost-cutting and its Banana Republic division have helped bolster group revenues, Gap has been left looking dated and rudder-less. Observers were not surprised, then, when Zara overtook it as the world's biggest clothing retailer this year. Gap has always moved at a slower pace than its fast-fashion rivals, which makes the axing of its European designers after just two and a half years, to refocus on its US team, all the more surprising - the first fruits of their labours hit UK stores only last August. Can Gap regain its position on the high street? We asked Nick Gray, former head of marketing at Ben Sherman and now managing director of retail agency Live & Breathe, and Zaid Al-Zaidy, who works on Marks & Spencer's account as head of inter-national planning at ad agency RKCR/Y&R, for their advice. Generally Apathetic Products - cruel, but accurate. Gap has become boring, staid and dated. Its ubiquity means it is now taken for granted and it reflects the lowest common denominator, following but never leading in the fashion stakes. The cachet it had when it entered the UK in 1987 is no longer novel or relevant. It used to do the basics really well, but consumers now have plenty of places to stock up on better, more affordable basics - Uniqlo anyone? Even Marks & Spencer is doing better in this area. Gap is trading from a large footprint, and consumer goodwill is diminishing fast. A long period of perceived under-investment means the brand has a massive turnaround job on its hands and had better move fast to prevent brands such as Abercrombie & Fitch and River Island stealing its market. Investing in a European design team was a good move and the range was better as a result. Its premature closure smacks of short-termism and lip service. It simply hasn't had the time it needed to establish itself. The likes of Zara have upped the stakes. Gap needs to address the fact that consumers now expect super-fast turnaround. Do the basics well but add another tier - special products with a fashion twist to entice consumers into stores. Improve the in-store experience, which can be muddled and crumpled - Gap currently undersells and commoditises its products in store. Once the product is right, there needs to be some compelling advertising creative. The last memorable campaign was Sarah Jessica Parker, who lost her contract to Joss Stone. Once upon a time, if someone had said, 'Coca-Cola owns Gap', you might have believed them. Everyone seemed to be wearing it, there was a distinct Gap-side-of-life and the communications did a great job of cultivating the iconic image and democratic fashion story that we loved and now vaguely remember. Gap is in danger of death by a thousand cuts. Abercrombie & Fitch does the authentic preppy look. Uniqlo sells staples such as cashmere jumpers and scarves for a penny a piece. Primark, Topshop and Zara offer access to high-end fashion cheaply, so what is left? Today's Gap is all things to all men - I can buy oversized jeans for me, a tent for my pregnant wife and a hoodie for my 10-month-old son that probably comes in an adult XXXL. Where's the desire or kudos in that? Gap's decision to axe its European design team in favour of a global one is a strategic move that allows it to access creativity from elsewhere. Let's hope we see more bold moves like this, which might reinstate it as a destination store. Remind everyone what Gap stands for, its role and enduring relevance. Define who the brand's core customers are and be exceptional to them. Make distinctive and desirable clothes: if Gap is about 'modern classics with a twist', then what is the Gap twist that makes its designs desirable? Be noticed: there is mileage in collab-orations with designers, artists and media titles. Making Gap 'cultural' again will add meaning to its old democracy. Cultivate the Gap-side-of-life throughout the shopping journey. The assistants don't smile any more.